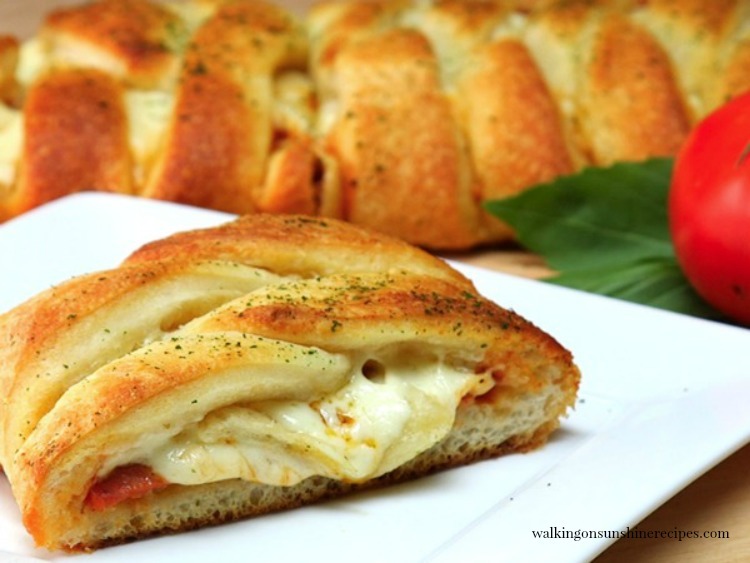 This Pizza and Pepperoni Braid is a fun and easy twist on traditional pizza that is ready fast! Put this on your weekly meal plan for nights you think you’re too busy to cook! Sometimes we all need an easy recipe to make for dinner for our families. 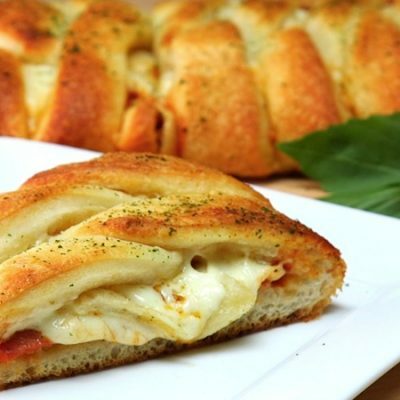 This Pizza and Pepperoni Braid is just that…EASY! And you can have dinner on the table in under 30 minutes. Add a side salad and dinner is served. One of the things I like most about this recipe is that you can customize it to your families favorite pizza toppings. My hubby loves chopped peppers and mushrooms, so I think the next time I make this I might make and extra one with his favorites. Or why not use your favorite cold cuts! I’m thinking a ham and Swiss cheese would also be really delicious. Leftovers heat up great too! So my hubby can take the leftovers to work with him the next day. This pizza and pepperoni braid recipe would work great for appetizers for football Sunday or if you’re having a large number of people over you can make a few different flavors. Either way your family is going to love this recipe and you’re going to love how easy it is to prepare. Unroll the can of refrigerated pizza dough onto a baking tray that has been sprayed with non-stick cooking spray or you can line the tray with parchment paper. Press the dough into a rectangle shape. Spread the tomato sauce down the center of the dough. Add the pepperoni slices on top of the tomato sauce. Using a pizza cutter or sharp knife, cut the dough into strips on both sides of the toppings. Fold one strip over the toppings and then fold one strip from the opposite side over the first strip. Repeat to form a braid. Brush the braid with the melted butter and sprinkle the top with the Italian seasoning. Bake 18 to 20 minutes or until light golden brown. Cut into slices and serve warm with extra tomato sauce on the side. Parchment Paper – I love to use the pre-cut sheets that fit exactly in my sheet pan, because I don’t know about you but I can never get the regular parchment paper to tear correctly. 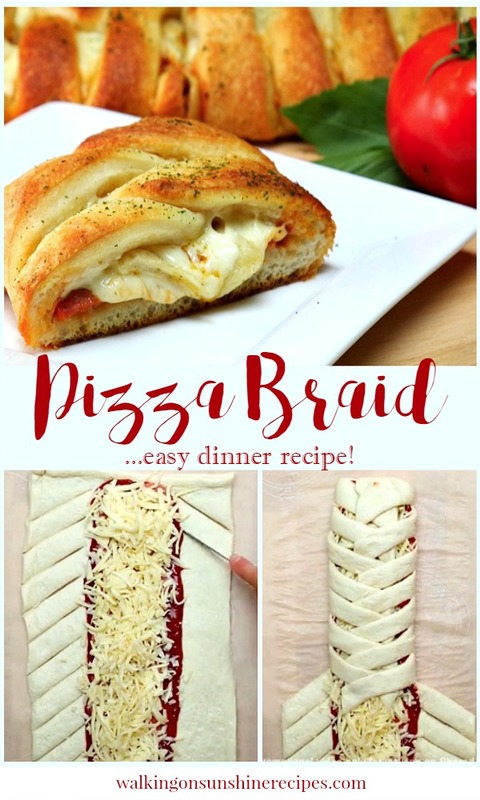 This pizza braid is a fun and easy twist on traditional pizza that is ready in less than 30 minutes with only 5 ingredients. I know or sure I would devour this. I could make a meal out of it…with a nice glass of wine. What a fun recipe. Perfect for entertaining too. 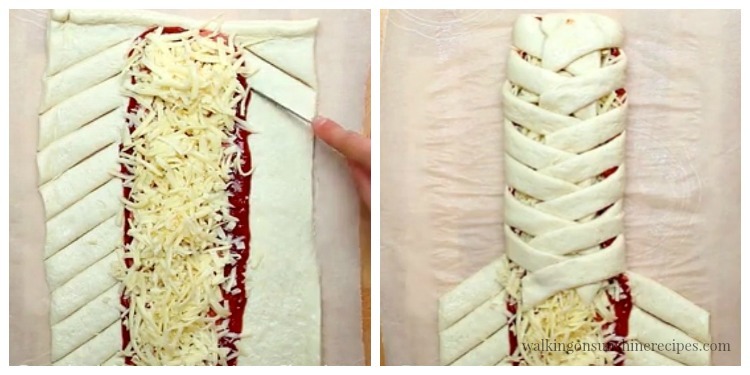 Love cheese and everything in making this amazing Pizza Braid. I am drooling with the look of it. This would last two seconds at our house. Nothing like a pizza filling wrapped up with delicious dough and cheese oozing out. I’m drooling looking at the photo. I’ve made several stuffed braids but not with this type of filling. I’ve waited too long. Yes, it’s gone pretty quick in our house too when I make it. I suggest making two! Thanks for visiting.